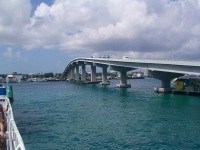 Connected to New Providence Island by a bridge, Paradise Island, formerly known as Hog Island, is one of the most popular destinations in the Bahamas. The island used to be privately owned until it was bought by developers in 1959 and turned into a resort haven. Since then, Paradise Island's owners have changed several times, including a stint of ownership by Donald Trump. It offers a variety of beaches to suit almost any taste, while most of the island's hotels and resorts can be found along Cable Beach, Paradise Beach, or Cabbage Beach. The miles of white sand host outstanding watersport facilities, including swimming, snorkelling, diving, jet skiing, sailing, and more. Perhaps Paradise Island's most famous resort is Atlantis, nicknamed 'Vegas by the Sea', where gambling mingles with waterslides, beaches, and a host of restaurants. Thanks to excellent weather and the popularity of its resorts, Paradise Island is busy year-round and the young and energetic are often to be found at resorts' bars and parties at any time of year. Those travellers wanting to escape the crowds can head over to the secluded Caves Beach or Love Beach.